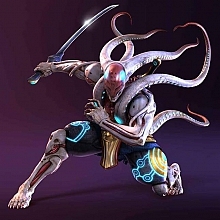 This topic will be for the skill part of Yoshimitsu Art of fighting... to be continued! All the lowkicks, hopkicks, low jabs etc. are working, besides Flash u+1+4... because this command is already busy. You can wait a little anyway... but I would not recommend it. Anyway, Bad Breath can be buffered after any Move that leave you in BT. - d/f+3,1 is not that effective anymore, single d/f+3 is better to make a mess. - where you can hit with d/f+3, you can also use u/f+4. 1.) 1+2+3+4, b,f,u,d+1+4 - Poison Sword Spin, causing Crumple Fall... it wouldn't be so strange if Yoshi didn't spin his sword AND exhale poisonous fumes at the same time! 2.) This works only when facing Bryan. 1+2+3+4, b,f,u,d+3+4 - ...it's The Poison Knee Taunt! Yoshi does a Knee Taunt just the same as Bryan has, but at the same time he exhales stunning poisonous Bad Breath that, if hits, stuns for good (similar stun to the one from Kamikaze). Yup, it means a free f,f+1+4 suicide and a combo for 72 points. P.S. Maaaaan... Yoshi really, really don't like Bryan, LOL. He taunts him just as good as Bryan does him. These moves look just great! Haha, I have been recently wondered "dammit, I wish Yoshi had a decent taunt in standing position", and taa daa! Just as I wanted it. The new buffering system sometimes tricks the players... it's almost perfect, but has some bugs in it... Very hard to define bugs, but they are there. You might wanna hear this Tenshi. Recent info has it that in Tekken 5.1 you can now guard during tech-roll. Sure, this might sound bad, but it gives Yoshi quite an advantage, seeing as how FC,d/b+1 is unblockable anyway. Your thoughts on this? HEHE That's great Anyway, my opponents do never ever quickroll or backroll, they just stay there... that's good for them (but if I predict it, they pay...). So it'll be just like in tekken 4. I just would like the quickroll to stay the wide-covering one... the T4 quickroll was very fast. In Tekken 5 Yoshi has much time to approach his opponent... or maybe it's only my imagination? Tracking... I was recently experimenting with this issue, and I came to some interesting facts... I started experimenting after I was arguing with my friend about d/f+2. The key to make even the linear move track very well is "f" alignment and timing. Inputting "f" just before d/f+2 not only aligns but also causes the move to be executed a little bit later, and so you hit just in time, just after the evading window of sidestep. It's so simple and basic that I even found it quite funny. Why didn't I see this earlier... And because I always executed a d/f+2 after a little dash ("f,N"), it hit sidestep very well. - f,f+2 PERFECTLY catches sidestep to Yoshi's left. Ultimate tool anti Baek's Flamingo step, remember it Just too good verus him. If you do f,f,n,2, it tends to catch the other sidestep, due to the different timing. But the delay is too big. - d+2 low punch greatly catches ss to Yoshi's right. - d+4 catches BOTH sidesteps. Great tool for nose-to-nose sidesteppers like Nina, spamming with her ss+2. - f+3 catches sidestep to Yoshi's right (sidestep-walk, too). But it's high, beware. - DGF 4 catches sidestep to Yoshi's left and with alignment even to his right. - DGF 3 catches ss to Yoshi's right. - beware d/f+4, it doesn't naturally catch ss-ers! It catches only due to speed and so you have more chances to hit in the proper timing. But in custom strings, the advantage/disadvantage situations and buffered steps can make your d/f+4 whiff easily. - ss-catching moves: adding f~ catches everything. Does f+1+2 or b+1+2 catch sidesteppers? nope. I think my f+1+2 has been steped to yoshi's left before, and b+1+2 is surprisingly linear.